Prometheus is the story of thee most unprofessional, uneducated, scientific crew’s bumbling adventure into a beloved universe. The revelations are flat and the sheer stupidity of the crew is off-putting enough to ruin the few good questions the film does raise. I don’t wish to catalogue the entirety of stupid actions taken by this “scientific” crew during the movie. But I need to highlight the ones that slapped me so soundly out of any suspension of disbelief that I felt slightly numb afterword. But I want to be clear: I’m not some snooty science know-it-all. I graduated from high school. I don’t honestly believe this crew did. Why is this man begging to die? How did he suppress his survival instincts enough to behave so badly? What are we doing here? This was the ONLY head you had! How scientific was it to do something irreversible based on a spur of the moment hunch? There are so many of these moments that I began to believe that mankind had been created as a host for (what will become) the Alien. [Huge Oh My God Spoiler] The big reveal of the film was that the Engineers created Aliens as a biological weapon, and created humanity. Mysterious alien races that kill themselves with biological weapons gone wrong and are human seems to be in fashion now. Prometheus handles the idea better than most I’ve read. I started looking at human “instincts” and “nature” as perhaps programmed attitudes and behaviors. Instead of saying the crew was all assholes, I began to think of the hostility towards each other as a cultivated behavior. It’s an exciting idea to think of all human behavior as specifically scripted. All of the sudden human history is much richer with meaning. As I write this, and think of you, my audience, I wonder if any of you are unlike me and believe in God. Then I suppose these grand ideas are old hat to you. Where I believe this differs is that God has some eternal plan, and the Engineers are experimenting while creating. The Engineers feel more like a puzzle that’s solvable, while God is just unknowable so don’t bother thinking about it. What I absolutely HATE about this ploy to introduce a mysterious, ancient, powerful, alien race then reveal it to be human is that it’s too human centric. I think of the ideas like “manifest destiny” and the Earth being the flat center of the universe. I come to science-fiction to see more than humanity. Or at least a convincing pretending. This big, beautiful, universe becomes flat and boring when the answer to everything is “humanity first and always”. Take the reasoning given for the creation of the Aliens. Biological weapon? It’s so shallow. Considering the, obvious, sophistication of technology the Engineer’s possess, along with how brutal the Aliens are, I can’t help but wonder if just making a bigger bomb wouldn’t serve the same purposes. But why that purpose!? Why is it all reduced down to designing a way to kill something? I want my ancient alien races to be damn near ineffable. Something clever, something more. Science-fiction is supposed to show more. Not just futurist guns and bombs with the same old emotions and desires driving everything. I loved the first Alien because, while it was a horror movie, the “evil” wasn’t evil. It was incidentally a horror movie. As far as I could gather from the film, Alien’s were just one species out there in the universe. They would kill you, but nothing personal, life can be “cold” sometimes (though the universe doesn’t have emotions). Now they’re a dumb civilizations dumb idea to kill some unknown thing. I never know where to go with a movie like this. 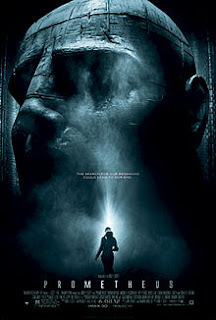 Would I go see a Prometheus 2? Yeah… I’m still interested in this vision of the universe. Plus I mean, H.R. Giger. But damn this thing was handled poorly. Though it did provide food for thought on the human condition. That can’t be discarded so easily. But as a movie!? Ugh.